Police: Victim's friends may have dared shooter to fire gun at FDR Park. Annie McCormick reports during Action News at 4pm on April 1, 2019. SOUTH PHILADELPHIA (WPVI) -- The suspect in the murder of the son of a Philadelphia police chief inspector may have been dared by the victim's friends to fire his weapon because they did not believe his gun was real, authorities said Monday. Captain Jason Smith of the Homicide Unit spoke to reporters during a morning press conference concerning five homicides that occurred this past weekend in Philadelphia. One of the victims was 20-year-old Nicholas Flacco. The reward for information leading to the arrest of the person who murdered the son of a Philadelphia police chief inspector Saturday night in FDR Park has grown to $36,500. 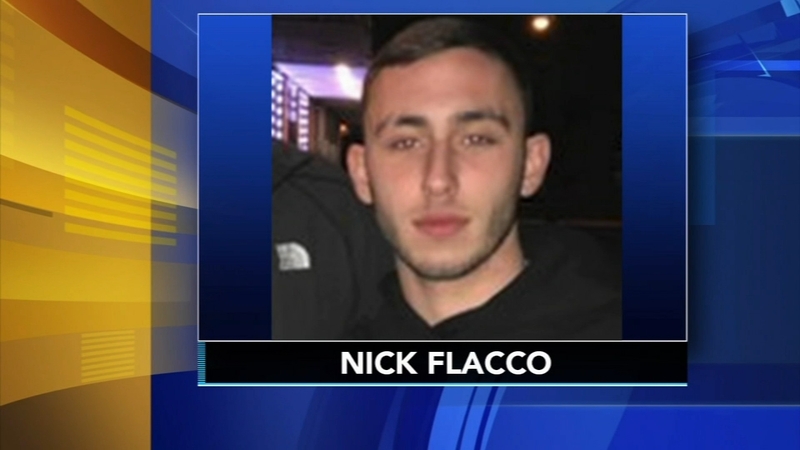 Flacco, a Penn State University student originally from Northeast Philadelphia, was back home for the weekend for his birthday. He was shot and killed around 10 p.m. Saturday on the 1400 block of Pattison Avenue in FDR Park where he was finishing a day of tailgating. According to witnesses at the scene, two groups of women got into an argument. The witnesses said Flacco and his friends may have been part of another group that was trying to break up the fights. Police are looking for more witnesses to come forward. Specifically, they are seeking to speak to a woman who allegedly called her boyfriend to come to the FDR Park tailgate in response to the fight between the two groups. Police believe that boyfriend was the shooter that killed Nicholas Flacco. "As of yet unidentified female was heard threatening to call her man and they should be afraid. A short time later, the offender arrived on location. He was armed with a revolver," Smith said. Police believe the boyfriend was driven to the scene with several other people in the vehicle. Smith said he fired a shot into the air. At the time, Smith said, the suspect was confronted by two of Flacco's friends. "They encouraged the male to shoot them because they didn't believe the gun was real at the time. The male fired a second shot to the side of the individuals and then fled the area," Smith said. According to Smith, the boyfriend returned a short time later. "He pointed the revolver at the Mr. Flacco and fired one time, striking him in the chest," Smith said. Flacco was taken to Penn Presbyterian Medical Center where he was pronounced dead. Philadelphia Police Commissioner Richard Ross was seen leaving the hospital after consoling the victim's father. He spoke to Action News this weekend. No one called police the first or second time shots were fired. In every homicide in The City of Philadelphia there is a $20,000 reward. In Flacco's case, the FOP and the local Firefighters Union IAFF 22 has added to that total for a $35,000 reward. The anonymous tip line is 215-686-TIPS. The total number of homicides in Philadelphia as of April 1, 2019, is 80 - up from the total of 72 last year at the same time.